Aside from Apple’s iPhone lineup that doesn’t support expandable storage because it would cut into Apple’s sky-high profits, just about every gadget out there supports microSD cards. Well, today is the perfect day to snag some more storage for those Android phones, tablets, eBook readers, and more. 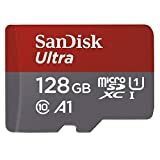 Amazon is running a killer sale on the Sandisk Ultra 128GB Micro SDXC UHS-I Card with Adapter, slashing the price to just $32! It’s SanDisk’s fastest card ever, and stock definitely won’t last very long at this price.